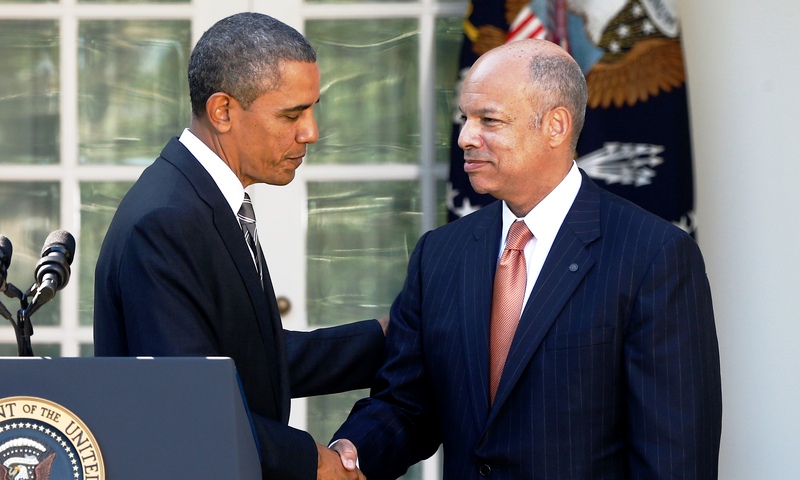 President Obama on Friday nominated former Defense Department general counsel Jeh Johnson to be the next Secretary of the Department of Homeland Security, calling him an "outstanding public service who I have known and trusted for years." If confirmed by the Senate, Johnson will succeed Janet Napolitano, who stepped down in September after being named the next president of the University of California system. Johnson, 56, is considered one of the legal architects of Mr. Obama's counter-terrorism policies. The president hailed his "deep understanding of the threats and challenges that face the United States." Mr. Obama commended Johnson for not only helping to dismantle al Qaeda affiliates but also for his work helping to repeal the Don't Ask, Don't Tell law that kept gays and lesbians from serving openly in the military. Johnson, Mr. Obama said, "believes in a deep and personal way that keeping America safe requires us upholding the values and civil liberties that make America great." In an interview with Charlie Rose in May, Johnson acknowledged that the Obama administration's policies have resembled the Bush administration's second-term policies, but he said, "We started from fundamentally different places." When asking Defense Department lawyers trained during the Bush administration about the legality of certain policies, Johnson said, "They'd tell me there's nothing that prohibits it." By contrast, he said, "The question that would be asked in the Obama years is... what authorizes this... What authorizes this specific activity in international law and domestic law?" Johnson told Rose that his biggest concern for domestic security is the partisan environment in Washington. "What worries me most is our inability -- and I'm optimistic this won't always be the case -- our inability in the political dialogue to have a calm, rational debate about new authorities, removing some of the restrictions on detainee movements at Guantanamo... People get very emotional about these subjects," he said. "You now have this very interesting dynamic where the far right and the far left have effectively converged in their thinking about war making, about the use of lethal force, about counter-terrorism." If confirmed by the Senate, Johnson will oversee a massive government bureau: the Homeland Security Department has more than 240,000 employees in several agencies, including the Federal Emergency Management Agency (FEMA), the Transportation Security Administration (TSA), U.S. Immigration and Customs Enforcement (ICE) and the U.S. Coast Guard.